One way to narrow down your search to your target market is to use Twitter’s own Advanced Search to find those talking about topics that matter to you in your area. 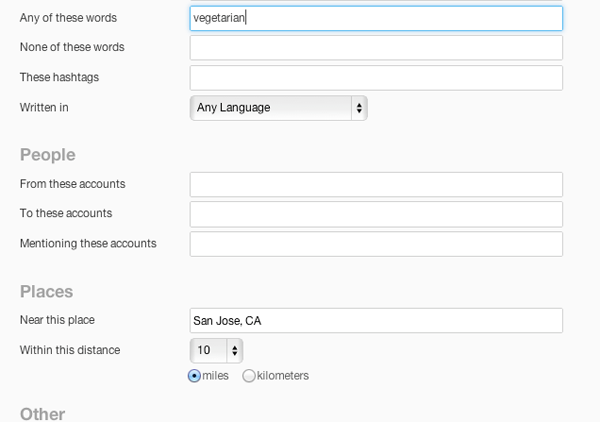 You can enter a keyword like “vegetarian” and then the location with a mileage radius defined as in the screenshot below. Most everyone there is your target market! Do you see any opportunities there to strike up a conversation? I can. You can also perform searches with the ? option selected to return just questions. Why? Because if someone is asking a question on your topic, it’s an open door for you to jump in and answer. Another of my favorite Twitter tools is Followerwonk. It’s a real gem for helping you create relationships with people of influence, and you definitely will want to use that to empower your local follower outreach, but first you can also find local Tweeps in there just as you did in Twitter. And there you have people to follow and connect with. This is limited as I mentioned before, however, because it’s just locating those with the vegetarian in their bio, not all those other vegetarians who are also talking about it. But those who make that claim in their bio have got to be pretty serious about it and probably are pretty vocal about it too. I’d say these are pretty powerful connections. Where Followerwonk really shines though is it’s ability to find followers in a certain occupation. This is perfect for service professionals and for those who form strategic partnerships with other professionals such as business advisors might with accountants and attorneys. 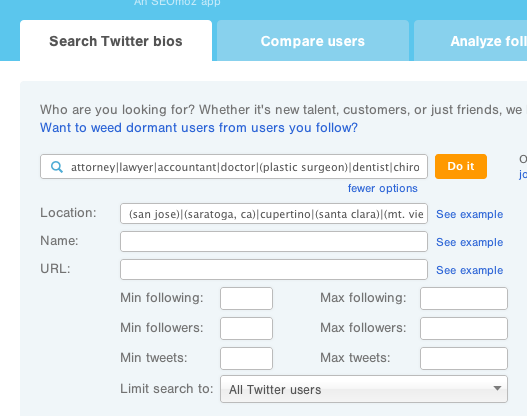 Here’s how I might find attorneys, accountants, doctors and more in San Jose, Ca. You can search on more than one at a time, just separate each search criteria with a | unless it’s more than one word, in which case you’d put the words in parentheses. Note the “Limit search to” option. With that I can search in those that already follow me to find targeted prospects in my area and then use that to my advantage by then targeting them with my Tweets. I could also sort out the influencers, but I’m getting ahead of myself. That topic is for another day. 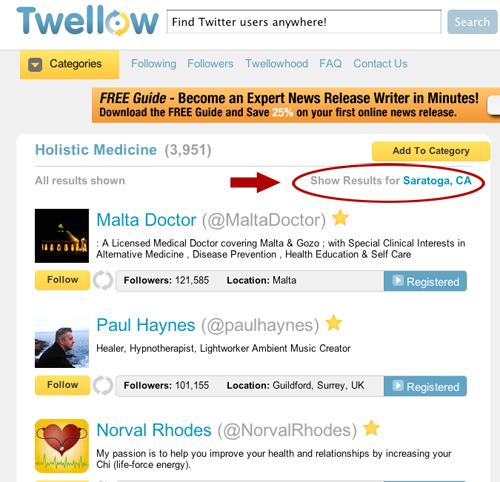 And here’s yet another way to locate local Twitterers – Twellow. 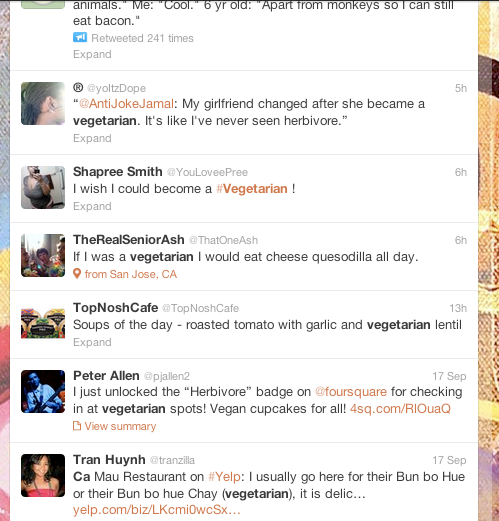 Unfortunately, you can’t filter out just vegetarians in San Jose in Twellow; you only get local results. But that shouldn’t stop you from following those in the results anyway. Chances are they will know someone who knows someone who wants to do business with you. So follow away and build your local Twitter community. 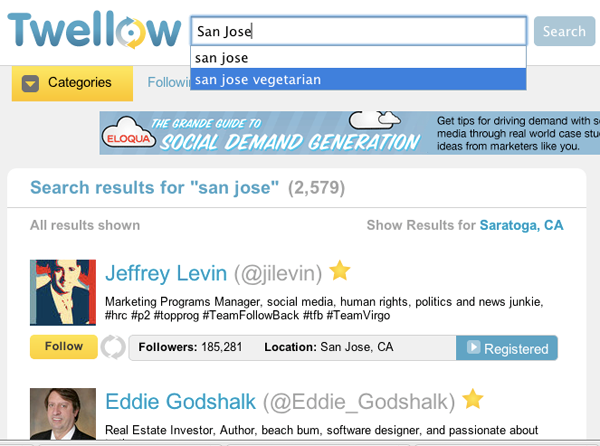 Twellow also makes it crystal clear who the local power influencers are. Take a look at the number of followers Jeffrey Levin has. Wouldn’t you like to get on his radar? Granted, most of his followers are not local, but many probably are and when he speaks about the great dinner he had at your restaurant last night, do you think they are listening? But here’s why I really like Twellow! Check out their categories and then click on any that are relevant or related to your business. You’re looking for topics your target market would be interested in. Could be health. Could be animals. Could be cooking. Now you have a list of everyone that Twellow has determined to be in that category by way of their Twitter profile, or those who assigned themselves to those categories in Twellow, and who are in the vicinity. More people to follow in really targeted categories! But I recommend not even going so deep as to filter by city. Do that too, but connect with influencers at the top level without the city identifier. 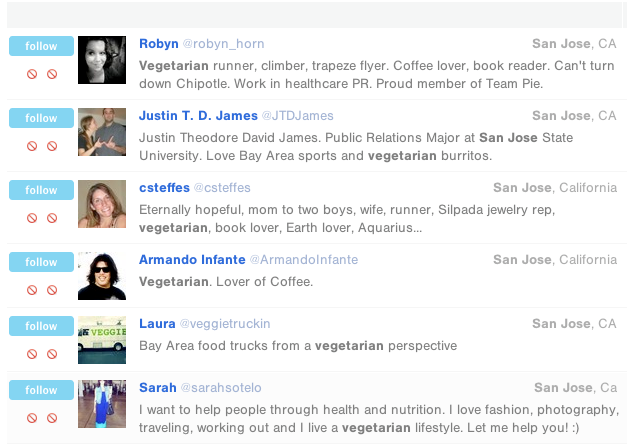 “But how is that going to help a vegetarian restaurant in San Jose,” you might be thinking. Because chances are your local influencers in your area are probably following influencers in the bigger space. If you can’t reach your local market in their front yard in San Jose, you might be able to meet them in the bigger circles they frequent. There are a number of Twitter tools that were specifically designed to capture local Tweets. Nearby Tweets is one of them. It was down at the time of this writing, but it definitely is worth checking out when it’s back up. It will determine where you are, then dish up tweets in your area. 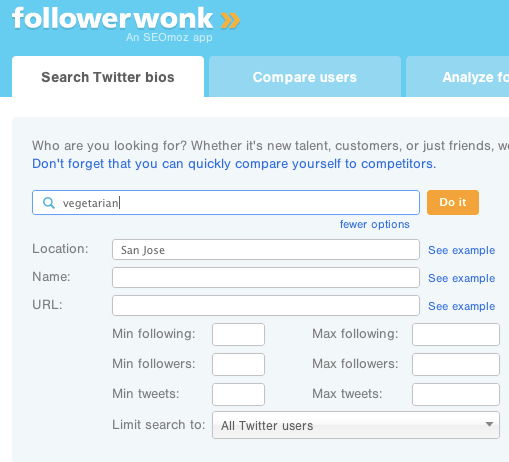 You can change location and keywords to narrow your search. We’ll talk about how to use tools like Nearby Tweets to do more than find followers in the next post. Suffice it to say that tools like this can be very powerful for your business. It’s an unwritten rule in Twitter that you should follow everyone who follows you. That doesn’t mean you have to, but the fact of the matter is many of those you follow will follow you back, so follow lots. You’ll get more ears listening to you that way. Ok, so now you’re following locals. Now what? Having followers is not enough, in fact could be downright meaningless. So you can’t stop there. Your goal really goes beyond getting followers. You need to make connections, build relationships and get your followers to be on the lookout for you. How do you do that? That’s the topic for the next blog in this subject. We’re going to look at examples of how local businesses are using Twitter to pull customers into their door. But first go forth and build your audience! And be sure to subscribe to our newsletter, “The Scoop,” to get notified when we post our next blog. You don’t want to miss it because that’s when we really get down and dirty. Sign-up form is below. And if anyone else has ideas on how to build a local Twitter following, please leave them below.